Just over a month ago the NYT/CBS Poll found Hillary Clinton's untrustworthy rating had soared to an astonishing 67 percent. It has come back a little since then, but still remains in Nixonian territory, as it has for most of the 2016 campaign. The reason that Clinton’s untrustworthy rating had soared to those dizzying heights was that it was only about a month ago that, after clearing her of criminal wrongdoing in the email scandal, FBI Director James Comey took a chainsaw to Mrs. Clinton’s credibility and, in a news conference and testimony before Congress, all but called her a liar. Indeed, when specifically asked if one of Mrs. Clinton’s sworn statements before Congress was true Director Comey said it was not true. We urge you to watch this compelling video review of the evidence and forward it to your friends and contacts. Comey’s testimony prompted House Judiciary Committee Chairman Bob Goodlatte (R-VA) and House Oversight and Government Reform Committee Chairman Jason Chaffetz (R-UT) to send a letter to U.S. Attorney for the District of Columbia Channing Phillips identifying several examples where Secretary Hillary Clinton's sworn testimony before Congress is incompatible with evidence collected during the Federal Bureau of Investigation’s investigation into the Secretary's private email server. It also tests, once again, whether or not the FBI has two standards of justice, one for the Clinton’s and one for every other American citizen. During a House Select Committee on Benghazi hearing on October 22, 2015, Secretary Clinton testified with respect to (1) whether she sent or received emails that were marked classified at the time; (2) whether her attorneys reviewed each of the emails on her personal email system; (3) whether there was one, or more servers that stored work-related emails during her time as Secretary of State; and (4) whether she provided all her work-related emails to the Department of State. Although there may be other aspects of Secretary Clinton’s sworn testimony that are at odds with the FBI’s findings, her testimony in those four areas bears specific scrutiny in light of the facts and evidence FBI Director James Comey described in his public statement on July 5, 2016 and in testimony before the Committee on Oversight and Government Reform on July 7, 2016. (1) Contrary to her sworn testimony, Secretary Clinton sent and received emails that were marked classified at the time. When Director Comey testified on July 7, 2016, he specifically addressed this issue. Rep. Trey Gowdy asked, “Secretary Clinton said there was nothing marked classified either sent or received. Was it true?” He said it was not. (2) Contrary to her sworn testimony, Secretary Clinton’s lawyers did not read each email in her personal account to identify all the work-related messages. Rep. Jordan: But I'm asking how -- I'm asking how it was done. Was -- did someone physically look at the 62,000 e-mails, or did you use search terms, date parameters? I want to know the specifics. Rep. Jordan: Will you provide this committee -- or can you answer today, what were the search terms? (3) Contrary to her sworn testimony, Secretary Clinton used several different servers and numerous devices to send and receive work-related emails. Rep. Jordan: In March, you also said this: your server was physically located on your property, which is protected by the Secret Service. I'm having a hard time figuring this out, because this story's been all over the place. But -- there was one server on your property in New York, and a second server hosted by a Colorado company in -- housed in New Jersey. Is that right? There were two servers? 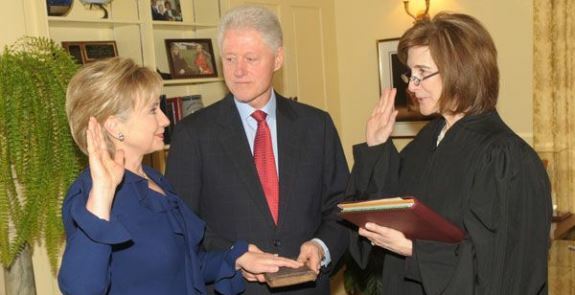 Mrs. Clinton: . . . that was already being used by my husband's team. An existing system in our home that I used, and then later, again, my husband's office decided that they wanted to change their arrangements, and that's when they contracted with the company in Colorado. Rep. Jordan: And so there's only one server? Is that what you're telling me? And it's the one server that the FBI has? (4) Contrary to her sworn testimony, Secretary Clinton did not provide all of her work-related email to the Department of Justice. Mrs. Clinton: Well, Congressman, I have said repeatedly that I take responsibility for my use of personal e-mail. I've said it was a mistake. I've said that it was allowed, but it was not a good choice. When I got to the department, we were faced with a global financial crisis, major troop decisions on Afghanistan, the imperative to rebuild our alliances in Europe and Asia, an ongoing war in Iraq, and so much else. E-mail was not my primary means of communication, as I have said earlier. I did not have a computer on my desk. I've described how I did work: in meetings, secure and unsecured phone calls, reviewing many, many pages of materials every day, attending . . .
Rep. Jordan: I -- I -- I appreciate (inaudible). As Goodlatte and Chaffetz observed, the four pieces of sworn testimony by Secretary Clinton described above “are incompatible with the FBI’s findings,” leaving the question before the FBI to be, once again, will there be two standards of justice; one for the Clintons and one for everyone else? Letter from Peter Kadzik, Asst. Att’y Gen., U.S. Dept. of Justice, to Jason Chaffetz, Chairman, H. Comm. on Oversight & Gov’t Reform, and Bob Goodlatte, Chairman, H. Comm. on the Judiciary (Aug. 2, 2016). Oversight of the State Department: Hearing Before the H. Comm. on Oversight & Gov’t Reform, 114th Cong. (July 7, 2016) (statement of James Comey, Director, FBI). Testimony of Sec’y Clinton to the H. Select Comm. on Benghazi. Submitted by vsteele on Wed, 08/24/2016 - 08:27. Hillary Clinton has gotten off too easily with her use of her private email server to conduct government affairs. We will never know the truth because she first lied under oath and the other she deleted most the classified emails that she received she also lied under oath about the Benghazi cover up she's getting off scot free because the FBI is playing double standard and putting Hillary Clinton above the law when she should otherwise be prosecuted and sent to prison of knowingly breaking the law. under oath disqualifies her from becoming our next President of the U.S. Submitted by ONTIME on Tue, 08/16/2016 - 10:49.